When it comes to customized projects, FedTech always has you covered. Even when the job is much larger than any regular project, we still have it covered. One of the latest additions to the production floor, our new waterjet, has a cutting envelope that is 156" x 360". This huge cutting area enables us to process large sheets of material at the same time. Having this ability is ideal when working with architectural orders, because it not only cuts the large or thick parts, but it processes them quickly as well. 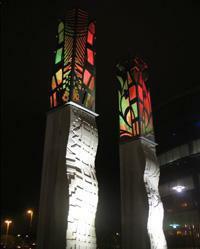 FedTech has manufactured everything from architectural signs to large, custom fixtures. Our custom manufacturing is all done in our ISO certified shop with our extensive manufacturing services. Whether you are aiming to get parts for your business, your home, or just for the fun of it, FedTech has the capability to help you complete your project and have it done just how you want it. To see examples of our work, you can browse the Photo Gallery. Or you can take a look at our Short Videos section to see FedTech in action. The project shown here was a recently completed for a movie theater in Burnsville, MN. 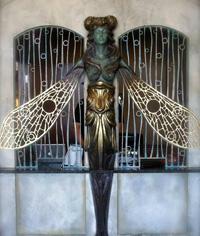 The woman with the wings is all part of their ticket window concept! This classic design was custom made for this exact location and was waterjet cut from stainless steel. After the parts were processed, they were assembled and painted. To see more about this project, click the photo above. Another fun project we completed at FedTech were these beautiful aluminum light fixtures pictured on the right. These aluminum parts were waterjet cut to precisely 24"-36" in diameter with multiple layers to make up the 3D light structure. When the parts were completely finished, they were assembled and hung from the ceiling at the University of Minnesota - Morris as a beautiful sculpture for all students, faculty and visitors to admire. To find out more about our laser metal cutting or waterjet cutting services, Contact Us today and see what FedTech can do for you.